Who will look after your medical needs during transportation? And most importantly, who will place your safety above all else? Fortunately there are answers to all these questions... because wherever you are, help will always come to you... Global Air Rescue. Global Air Rescue is a comprehensive air ambulance service dedicated to delivering patients to the best medical care anywhere in the world. Air ambulances combine the latest in private jet or turbo-prop aircraft, high-tech medical equipment and specially trained airborne medical teams. The reasons to use an air ambulance service are many; an accident or medical emergency away from home, specialized treatment not available in your area, or perhaps the care and assistance from family in another locale. Whatever your reason, Global Air Rescue knows that you want to arrive quickly, safely in the most cost-effective manner. We begin with a consultation between the highly qualified Medical Director or medical staff member and your primary care or attending physician to determine the appropriate equipment and staff for your journey. Dedicated to delivering the unsurpassed bedside-to-bedside service, we next arrange for ground transportation to pick up the patient and medical records. The in-flight medical staff may even accompany the ground ambulance crew to the discharging facility if it is determined to be in the best interest of the patient. Once at the departure point the flight crew and highly trained medical staff transfers the patient into the aircraft. Depending on the individual circumstances, family member(s) can be seated alongside the patient and travel in the aircraft. Vital signs and necessary medications are thoroughly checked using state-of-the-art, cardiac care equipment. During the flight the patient will be accompanied by the medical staff and monitored throughout the flight. The patient's safety and comfort are paramount. Upon arriving at the destination airport, a ground ambulance will be standing by to transfer the patient to the receiving bedside where their medical records and a full medical report of the patient's condition during the flight will be delivered. 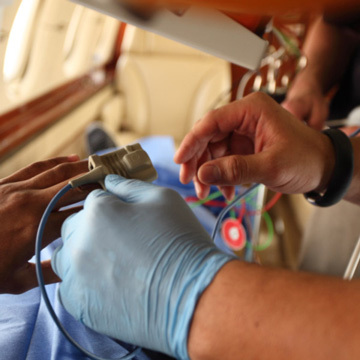 This seamless bedside-to-bedside service is the hallmark of Global Air Rescue. You may also rest assured that at Global Air Rescue, safety is more than just a buzzword. Since 1991 the management team of Global Air Rescue have dispatched over 7000 missions in over 150 countries on six continents. So, take the guesswork out of emergency air travel and call Global Air Rescue today. Because wherever you are, help will always come to you.